Due immediately after offer accepted! 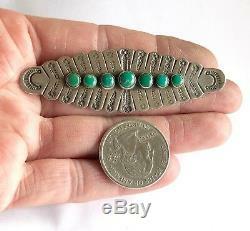 Fred Harvey Era Vintage Navajo Sterling Silver Green Cerrillos Turquoise Pin. 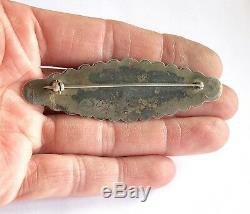 The pin measures approximately 1" X 2 7/8". Total weight is approximately 11.5 grams. 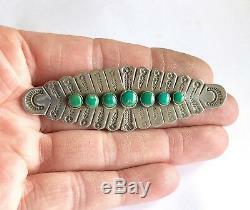 925 parts per 1000, Sterling Silver. No stamp, tested to guarantee sterling silver. This item is in excellent used condition, but will exhibit the expected surface scratches and dings to the silver from normal wear. All carat weights and dimensions are approximate. We try to be as accurate as possible but all scales have a slightly different result. We try to take photos that are true to the actual color but every monitor shows colors differently. All stones are 100% authentic unless otherwise noted. We treat customers like we would like to be treated. Customer service is our #1 priority. 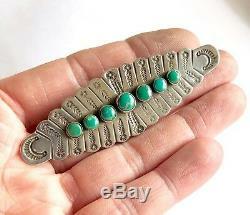 The item "Fred Harvey Era Vintage Navajo Sterling Silver Green Cerrillos Turquoise Pin" is in sale since Sunday, January 27, 2019.